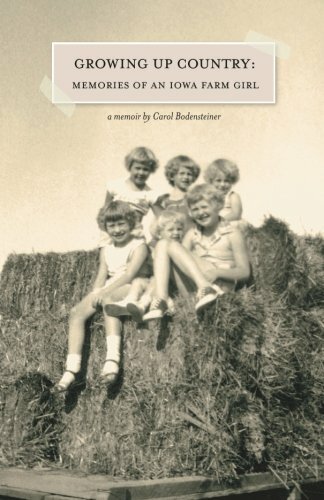 about this book: Growing Up Country: Memories of an Iowa Farm Girl shares everyday stories of what it was like to grow up on a family farm in the middle of America in the 1950s. I wrote this memoir because my mother always encouraged me to write our stories. And we always try to do what our mothers want, right? As I wrote, I thought I was only telling the stories of my family. Imagine my surprise when readers told me my stories were also their stories. Whether it was butchering chickens or doing laundry, practicing for a 4-H demonstration or losing money in a schoolyard bet. Each chapter triggered memories of their own growing up experiences. Those memories inspired readers to talk with members of their families. That's really one of the most gratifying things for me. As a result of readers telling me how much my stories have meant to them, I've become an advocate for capturing our everyday stories. People may think the simple stories of their lives aren't worth preserving, but they are. The stories of how we lived every day are the fabric of our lives. They're what bring us all together as families, as a society.